MONTEBELLO — With first place in the Almont League at stake, senior kicker Enrique Lozano kicked a 35-yard field goal to give Montebello High School a 31-28 overtime victory over visiting Bell Gardens on Friday night in a pouring rain. Bell Gardens won the coin flip in overtime and drove the ball to the 13-yard line, but senior kicker Esequiel Covarrubias sent a 35-yard field goal attempt wide right. Then Lozano won it for the Oilers. With the victory, Montebello improves 5-4 overall and 4-0 in league, while Bell Gardens falls to 3-6 and 3-1. Trailing 28-21, Bell Gardens tied the score midway through the fourth quarter on a 6-yard pass from junior quarterback Jordan Cardenas to wide receiver Marcelino Carillo. Cardenas had a game-high 235 yards and a touchdown on 16-of-29 passing. La Serna High School kept its Del Rio League title chances alive with a 49-20 victory over Pioneer on Friday night at Whittier College. The Lancers (7-2, 3-1) can only share the league title if they defeat Whittier and Santa Fe defeats first-place El Rancho next week. La Serna built a 39-0 halftime lead. Quarterback Enrique Pacheco left the game after the first series of the second half. He completed 12 of 19 passes for 197 yards with touchdown passes of 2 and 9 yards to Joseph Carillo. 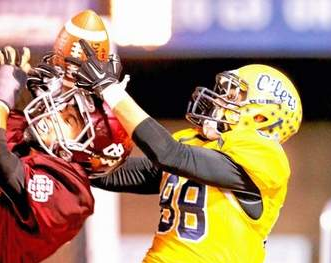 Carillo had six catches for 64 yards. PICO RIVERA — The race for the Del Rio League football championship is about over. 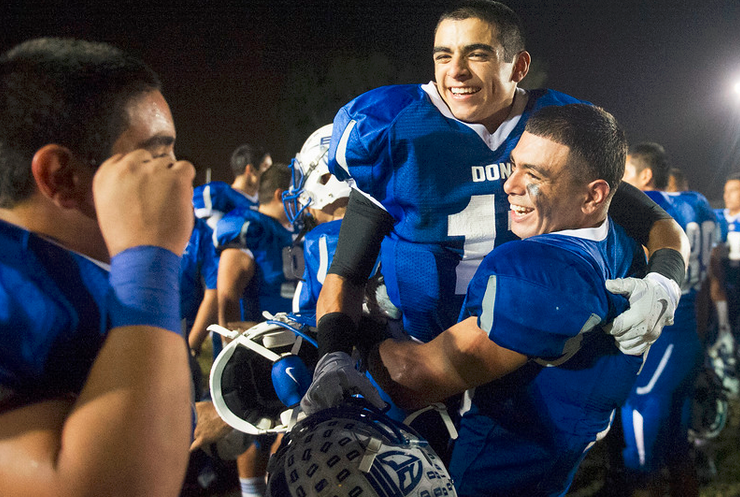 El Rancho High School put the title chase in check on Thursday. Andrew Perea accounted for 281 yards and three scores and the host Dons clinched a share of the league title with a 48-14 victory over California. James Garcia rushed for 60 yards and a touchdown for El Rancho, which improved to 7-2 overall and 4-0 in league play. The Dons, ranked No. 3 in the area this week, can clinch the title outright with a win over Santa Fe. They will be the league’s No. 1 representative by virtue of a win over second-place La Serna earlier this season. Nathan Lowden rushed for 89 yards and a touchdown and Robert Leos had a 96-yard kickoff return for a score for California, which slipped to 5-4 and 2-2. El Rancho all but put it away by halftime. Perrea accounted for 232 yards and three touchdowns to give the Dons a 27-7 lead after two quarters. Carlos Martin had two touchdowns in the first half to lead the Highlanders (6-3, 4-0), who clinched a share of the Freeway League title with the win.